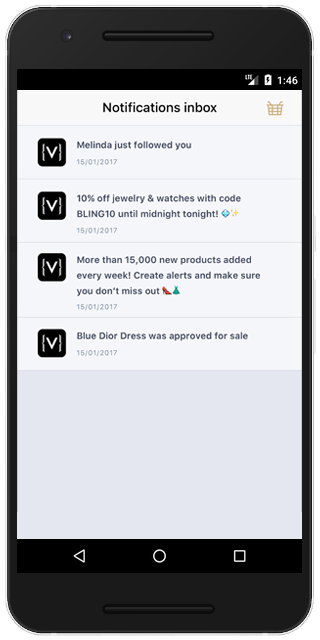 Introduced in Batch 1.9, the Inbox API allows you to fetch and process notifications that this user has previously received, even if their device was offline. The API gives you access to the entire notification, including its raw payload. It also lets you know if the notification has already been read, and allows you to mark one or all notifications as such. Now that you've got your fetcher instance, it's time to fetch notifications, and display them! This returns a copy of all the notifications that have been fetched. Useful for a list adapter. Warning: Calling this always makes a copy of the objects, so you should cache that method's result. Allows you to fetch notifications that might have been received after the initial fetch. This is useful for implementing a refresh feature. Fetches the next page of notifications. Batch will not fetch all notifications at once, but only small batches of them in pages. Use this method to load more notifications. Lets you know if more notifications might be available. Use this to make an infinite list, or a "load more" button. Note: BatchInboxFetcher and its methods are well documented using Javadoc. Unfortunately, Android Studio will not fetch it. Please use the web API Reference of BatchInboxFetcher to get detailed explanations about what every method does. Both fetch methods take a listener, which the SDK will call you back on either on failure, or success. Success callbacks include information about the operation to operate on the data, but you can very well do with the global methods. Note: By default, you will be called back on the thread that you called Batch.Inbox.getFetcher() on. Please see below if you want to change that behaviour. Once you've fetched notifications, you will end up with a list of BatchInboxNotificationContent objects. If you want to use advanced information about the notification, you can call getPushPayload(), which will return a BatchPushPayload instance. Just like with a custom receiver, this object allows you to fetch information, such as the deeplink, or big picture/large icon image URLs. Standard parsing good practices apply: Make sure to check every cast and handle errors gracefully, and never assume anything about the payload's content. Use markAsRead(notification) with the notification you want to mark as read. In both cases, the notifications will be marked as read locally, but refreshing them might mark them as unread again, as the server might not have processed the request. These methods return quickly, and are thus safe to call on your UI thread. Note that notifications that have been opened when received are automatically marked as read. A default limit is set to avoid going over memory by accident. The handler that will be used to run the callbacks.